TRAVERSE CITY — NMC alumnus and current Foundation board member Bruce Byl has been named the 2015 recipient of NMC's highest honor, the NMC Fellow award. A 1979 aviation alumnus, Byl received a scholarship during his student days. He said he promised himself then that he would eventually return the favor. “It made the difference on whether I could continue in college or not," said Byl, 60, who went on to earn a bachelor's degree in marketing from Michigan State University and a business career as eventual president and CEO of Office Concepts, a Chicago-based Steelcase commercial furniture distributor. “As a past scholarship recipient, I’m passionate about giving back to NMC so that other students may experience the same opportunity that I was afforded. By raising scholarship funds through my efforts at the Foundation, I’m able to assist many individuals in our region realize their educational and career dreams. To me, that’s a very satisfying way of giving back," Byl said. By any estimate, Byl has paid it back and then some. A native of Spring Lake, Mich., he enrolled in NMC following his service in the U.S. Marine Corps. He made his first financial gift to NMC in 1984. Byl and his family moved to Traverse City, his wife Mary's hometown, in 1994 and he joined the NMC Foundation Board in 2006. 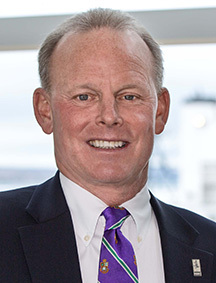 He has since served as Foundation board chair and on multiple Foundation committees, including his current role as chair of its Major Gifts committee. He remains active in the local business community, and in 2013 founded Taste Bud Branding, a specialty marketing firm focused on Michigan-made food and beverage items. Other community commitments include serving as director of Chemical Bank’s Traverse City Community Bank Board, director of Metalworks in Ludington, Fab-Lite in Manistee, as an elder and on the finance committee at The Presbyterian Church, co-founder of Food Rescue of Northwest Michigan, and former trustee at Interlochen Pathfinder School. In 2009, he was named an Outstanding Alumnus of NMC and also awarded the national Council for Resource Development Campus Impact Award for Volunteer of the Year. NMC Foundation Executive Director Rebecca Teahen cited Byl's networking on behalf of the college as another important aspect of his influence. "We have many donors and volunteer board members who credit Bruce directly for getting them involved," she said. "Cumulatively, these donors and volunteers have a tremendous impact on our success, all thanks to Bruce." NMC has named Fellows each year since 1964 as a way of recognizing and thanking those individuals who have made special contributions to the college. A dinner in Byl's honor will be held later this year. “It’s an honor to be included with such a dedicated group of NMC supporters. I greatly enjoy being involved with the Foundation and knowing our efforts are positively changing people’s lives in our communities. NMC is a great asset to our region by providing outstanding and affordable educational opportunities, cultural enhancement and continued economic vitality," Byl said.